Thermage - With Comfort Pulse Technology System! Thermage is completely non-invasive: no surgery, no injections. 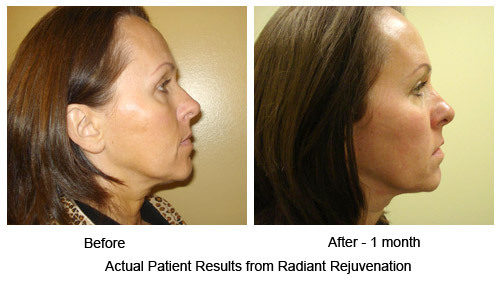 A single treatment tightens your existing collagen and stimulates new collagen growth. Improvements are both immediately visible and continue up to six months. Results can last for years depending on your skin condition and aging process. The Thermage procedure is available only in the offices of qualified physicians who specialize in cosmetic procedures. The Thermage procedure itself is normally done as a single treatment that takes from 20 minutes to two hours, depending on the treatment area. What's more, there is no downtime, so you can quickly resume your normal routine. Radiant Rejuvenation & Cosmetic Surgery was the first clinic in the Seattle area to offer the Thermage CPT system (Comfort Pulse Technology), which provides patients a much more comfortable, essentially painless and more effective Thermage treatment to tighten the skin. Follow the link to visit our website devoted to the Thermage procedure for more information about Thermage with the CPT system. With the Fraxel Dual 1550/1927 wavelength laser from Solta Medical, Radiant Rejuvenation is able to offer many advantages to our patients. As we get older, the collagen and elastin fibers in the dermis layer of the skin break down faster than our bodies repair them, leading to wrinkles and sagging skin. Also, often as a result of sun exposure, older skin often develops brown age spots and uneven pigmentation. The Fraxel Dual 1550/1927 laser works to correct these problems by using laser light to reach the dermis to stimulate the body’s natural formation of collagen and elastin and correct uneven pigmentation on the epidermis. The results of fresher, more youthful looking skin are wonderful! Fraxel helps to improve: wrinkles, acne scars, surgical scars, age spots/sunspots, melasma, and actinic keratoses. Many of our patients have a combination of Thermage and Fraxel for truly amazing results! Clear + Brilliant is a new fractional laser treatment from Solta Medical, the pioneers of fractional laser technology. Clear + Brilliant is a gentle laser skin care treatment that fights the effects of aging and rejuvenates the skin from the inside out. Each treatment refreshes the skin and improves tone and texture, gives a youthful glow, and reduces the appearance of pores. More information on Clear + Brilliant. With elos Laser Skin Rejuvenation Treatment, you can say goodbye to Rosacea(redness), spider veins, age spots, uneven skin tone and sun damaged skin. Powered by the revolutionary elos Laser Technology, the combination of energies of light and bi-polar radio frequency, offers a complete solution to the challenges of skin treatment with reduced overall required energy output - enabling safe, effective treatment. Highly selective light energies are absorbed by the hemoglobin and pigmented lesions, while bi-polar energies selectively heat blood vessels - minimizing the effect on pigmented structure. Click here for before and after pictures. Say goodbye to unwanted facial and body hair. elos Laser Hair Removal is effective for most hair colors and all skin types. Treatment areas include: upper lip, cheeks, chin, neck, breasts, stomach, arms, shoulders, bikini area, legs, and back. elos Acne Treatment is the first and only technology that uses elos laser technology, combination of bi-polar radio frequency (RF) and light energies to effectively and gently resolve active acne by treating it at its source. The combined energies of elos laser enable highly selective targeting of the sebaceous glands and acne bacteria. Infrared and RF energies reduce sebaceous gland activity while blue light simultaneously destroys active acne. SilkPeel's Dermalinfusion is the most dynamic skin treatment available today. It is the only procedure that provides both non-invasive exfoliation and delivery of skin-specific topical solutions, leaving patients with fresher-feeling and better-looking skin. SilkPeel microdermabrasion is safe and painless, allowing patients to achieve optimum results on an accelerated basis without the complications and discomfort usually associated with invasive procedures. In addition, SilkPeel microdermabrasion is unique because it does not use crystals or other abrasive particles that can irritate the skin.